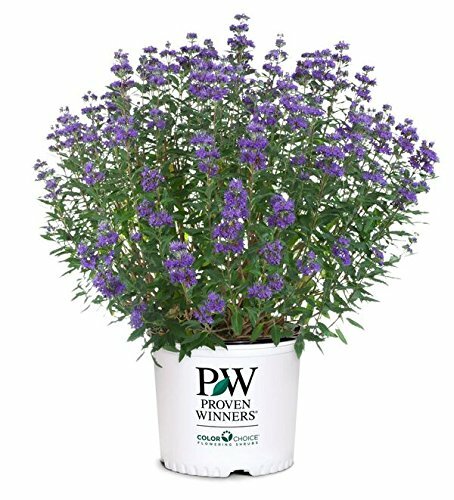 You'll love this new caryopteris - it has extremely dark, glossy foliage, a compact habit, and deep blue flowers. It adds much-needed color to the late summer landscape and makes a handsome companion with perennials. A great favorite with pollinators of all types! Caryopteris demands a sunny spot and very well-drained soil. Wet soils, particularly those that remain soggy during periods of cold weather, will cause root rot. For this reason, we recommend early season planting of caryopteris in zones 5 and 6. Caryopteris should be cut back every spring to ensure sturdy, dense growth. However, do not cut it back until new growth begins to emerge on the stems in spring. Then, cut it back to just above a large, healthy bud.